“Smokey Mountain in Manila is a world you'd rather don't want to see,” says travel blogger Sabrina from Just One Way Ticket. It's one of the world's most impoverished areas. The 25,000 inhabitants live on piles of garbage, and the way people make a living here is by picking up the recyclable parts. The air is so polluted that tourists are asked to wear masks. Sabrina visited Smokey Mountain with Smokey Tours who donate 100% of the profits to the people in the slums. 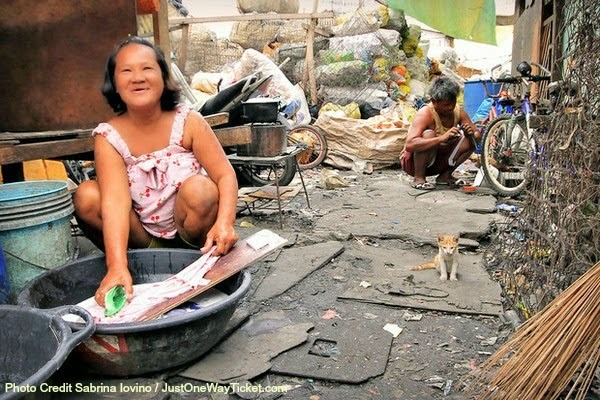 Read more about Sabrina's visit to the slums in Manila here: Smokey Mountain: A Walk Through The Slums Of Manila, Philippines. Aww... that first photo is absolutely adorable! The cat also looks a lot like our new addition - Coco. GROS BISOUS à toi Vanessa ! 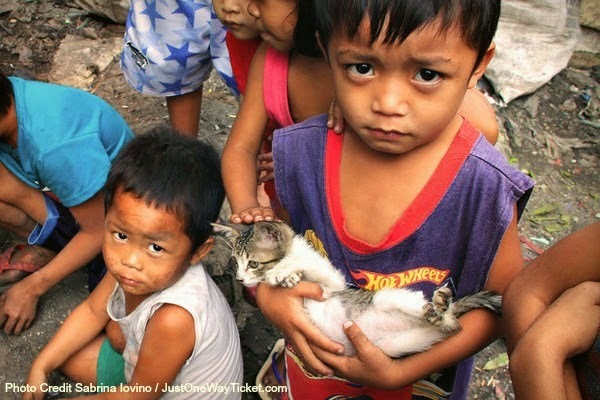 We are amazed by the gentleness of the little boy holding the kitten in the first picture. It's heartbreaking, yet they can still smile. Amazing. That's really sad for the people and the cats. Wow, how raw and honest. Thank you for sharing. How sad that people have to live like that in the 21st century! So sad in this day and age. Have a tremendous Thursday. How sad that these folks have to live this way, but I sure see a lot of smiles. Bless each and every one of them. These pictures show us how fortunate we are. We must not take our comfort for granted. It's pretty sad there are still people living in those conditions. Cats can only do so much. With any luck they'll get the help they need. Well, kitties everywhere need love too. I may have visited it once many years ago when I was a teenager for a church outreach activity. It is indeed sad to witness families living in such harsh conditions. It's sad to see they are living like this. But lovely to see smiles on some faces. Oh wow...so heartbreaking ....but what a testament to human resilience. That's really sad to see. I couldn't even find the cats sometimes until I looked hard. This is so sad. and that little boy's eyes are heartbreaking. Yet this woman manages to give a big smile as she washes her clothes. She is strong! I guess the kids have no toys, and the cats are all they have. 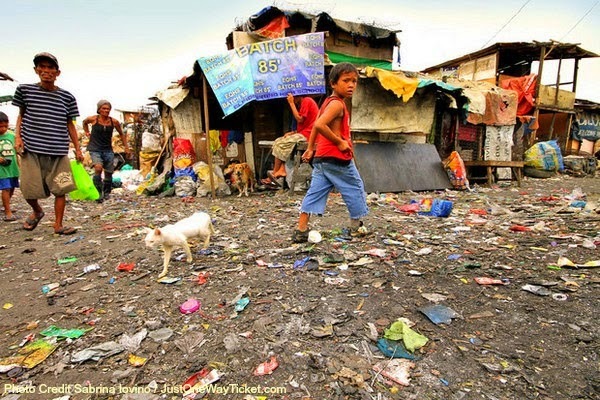 I wonder if the government is corrupt, as they do not help these poor kids. Great documentary images. It's gut-wrenching to see how so many in the world live. 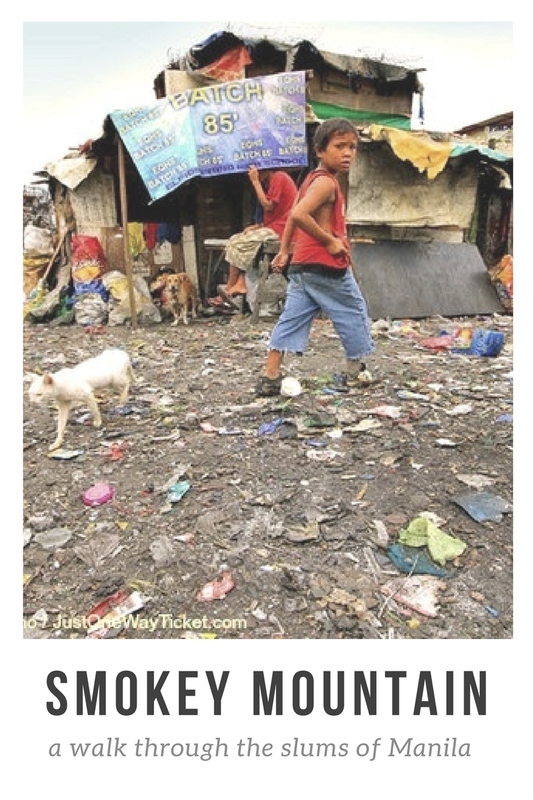 I saw similar views in Thailand, though I think Manila tops Thailand in street children populations. There are so many children living in terrible conditions all over the world...thank goodness for organizations like Smokey Tours who do what they can to help. Wow. It is good that Smokey Tours is giving some awareness to this area. Wow I love how the one women is smiling. Kind of amazing how lucky we are. I didn't realize that they do tours to Smokey Mountain, but I guess if the tour operators donate 100% of the revenues to the residents of Smokey Mountain, that would help. It's beautiful to see how despite poverty, the people there still find reasons to smile. It is sad to see the poverty that these people are living in. The photo with the child frowning while he holds the cat just breaks my heart. What is interesting is that the cats still appear to be in good shape and perfectly content. That is so sad. I have a friend who is from the Philippines and she is going back tomorrow for a month (she goes once a year)...wish she could bring kitties home with her. So sad and horrifying for the people there as well the cats. Oh how terrible! I've seen images like this on TV. I just can't fathom people living like this and feel so blessed to have our small, over-crowded home that needs fixing up. I did think it interesting the name of this place because we have a Smoky Mountains (spelled differently than your feature) National Park just south of Knoxville, TN. Wow, it's sad that places like that exist in the world. I have (and my kitties) truly have a lot to be thankful for and this is a stark reminder. It's amazing to see the smiles in those last two pictures. It's hard to see these kinds of living conditions but a good reminder to pray. We visited in Dec - same tour but they limited us on taking photos. Heartbreaking. First time visiting your blog - love the cat theme! It is sad to see people living in these conditions. But, it is also nice to see the sweet smiles. Cute kitties.. Happy Easter! Thank you for linking up and sharing your post. Have a happy weekend! Amazing how these people and the cats survive in such a world. Moving photos. Definitely not a good place to live in. Bantar Gebang is the similar situation in my country. Ces gens ont l'air heureux, et pourtant quelle misère. Love all the kitties, but the kids look sad, glad they have them to love! Why dusn't sumpawdy do sumfin' 'bout cleanin' da place up stead of just givin' 'em mowe noms. Altho'' da kitties do need a foo mowe meals. They awe sooooo tiny. How sad that people still live like this today. Yep, Me feel so sad for them...feel me is so lucky ! They have almost nothin' and yet, they still show love to those cats. Looking at these shots makes you even more grateful for all you have. Thanks for sharing. HAPPY EASTER. Hope you've had a good Easter. That first picture is heartbreaking. Very sad pictures, so much emotions in the first one! Heartbreking but I love the smiles and the cats. Simply stunning episodes of life captured with your eye view. That's what people have to live in. That is how much life is celebrated in their own way. Thank you for these photos, Vanessa. Taking a deep breath and starting my day from my part of the world. It is so true that a picture tells a thousands words. 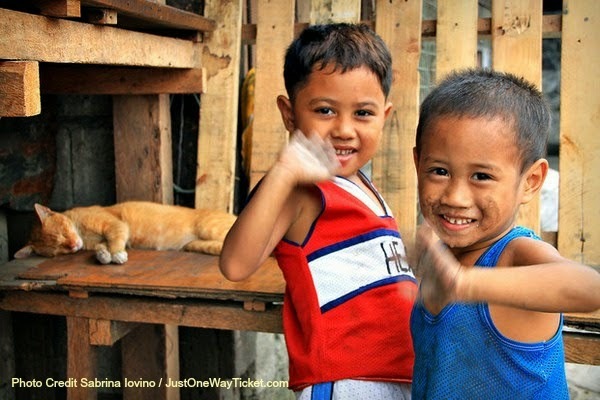 Beautiful images to portray life in Manila. Blessed you shared this at The Weekend Brew. Love kitties. Just goes to show they are content anywhere. We could learn a lot from them! Heartbreaking on so many levels. 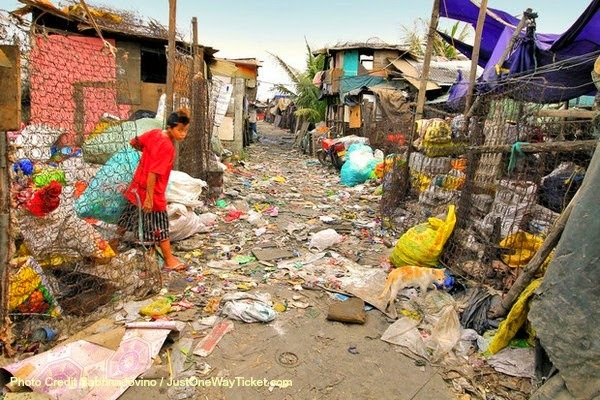 So sad to see such poverty and terrible living conditions. I hope the kitties help bring some brightness to their world. Thank you for sharing. It's sad to see. They have so little and yet they are sharing it with the cats. Sometimes it's hard to see the reality, yet still very beautiful. I love the way you captured the look in their eyes in the first photo... Beautifully shot. It's a shame any one has to live like that, the cats are surely very beneficial keeping the rodent population down. It's sad to see such awful conditions. Aww that is really sad :( Hope those cats are ok.